This posting is a warning more for readers than for writers, but self-publishers should be conscious of possibly dishonest online booksellers they may get involved with. Your readers won’t be happy to discover that they’ve been overcharged. Unfortunately, you can’t control who sells your books or what they charge, but if you find a bookseller is being dishonest, let the company know. The top screenshot from HotBookSale, a company that promises “great discounts,” lies about the list price of one of my books (it’s really $29.95 not a stupid $36.54). It offers a phony 26% discount (which they strangely call 10%) if you join their BestBrandValues plan for about $240 per year. Amazon.com will sell it for even less ($26.95) without joining anything. 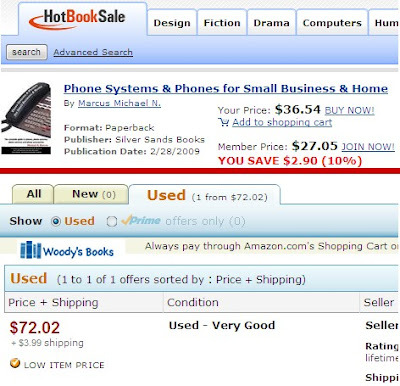 Be aware of wacky ripoff prices from independent booksellers on Amazon. Another one of my books has a list price of $15.95 and that's what Amazon itself sells it for. Strangely, other dealers sell it for as much as $49.18 -- more than THREE TIMES the normal price. I can't imagine why anyone would buy from Booksbylab, or how they stay in business. These thieves even offer a used copy of the book shown above for $53.25. Amazon sells it new for about half of the used price. Booksby lab is not even the worst of its breed. Woody's Books is offering a used copy for $72.02! That's almost enough money to pay for three new books. I can understand why a used copy of a rare out-of-print book has a higher price than when the book sold for new, but it makes absolutely no sense for used versions of current books to be priced so high. I too am mystified. I expect these con artists hope someone will accidentally hit the submit key or look at the site while stoned out on chemicals.